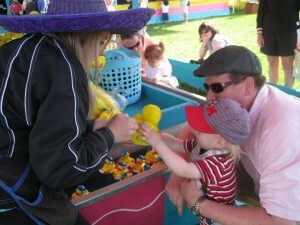 As far as cute, little community events go; the Point Grey Fiesta was a blast. My 22 month old loved the parade, goodies and rides. The motorcycle display put on by the Vancouver Police Department’s Motorcycle Drill Team sent him over the moon. Everytime they roared by, he would sign, “more, more” furiously. Everyone around us seemed to be in a stellar mood. Even the shoe repair man across the street in his apron was cheering away. This event is full of warm fuzzies (as a friend put it, “shiny, happy people”). The parade is fun and casual with lots of things given to the kids like candy, stickers, balloons, hats etc… The atmosphere is busy but not crowded which is good for small children. Most unusual thing: St Helen’s church had a man dressed in monk robes carrying their flag on roller blades. He literally floated down the street. Most adorable thing: A 6 year old boy dressed like a pirate riding his bike which was decorated like a pirate ship. Most counterproductive thing: Women from Curves handing out candy. The rides and midway assembled at Trimble Park were also a lot of fun. Yes, the rides were pricey but hey, it’s once a year thing. Tickets were a buck a piece and the toddler rides were 3 tickets. For me, it was worth every penny to see Caden on his first amusement park rides. 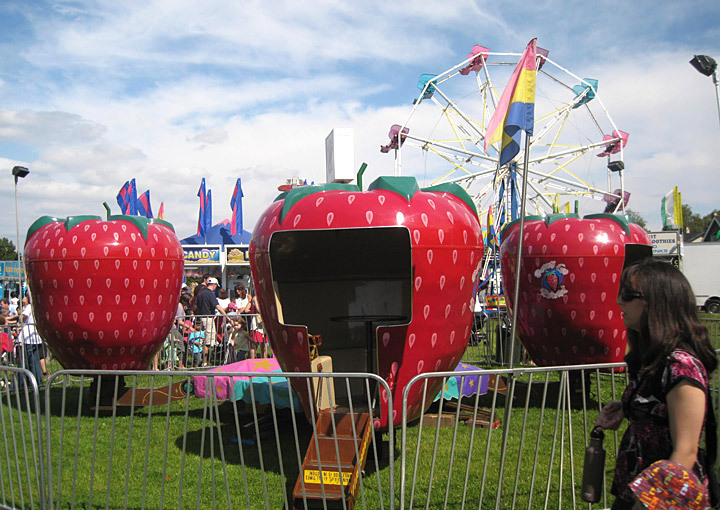 He loved the Merry-Go-Round, the Train and the Giant Strawberry that spun like a Teacup. 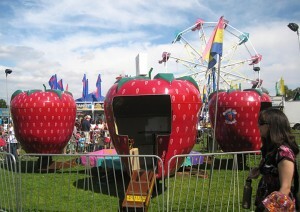 There were rides for bigger kids like the Octopus and Salt ‘n Pepper Shakers to name a few. Definitely something to make everyone feel woozy. If you don’t feel like forking out the cash, you can spend your time at the playground and wading pool at the far end of the park. There’s lots of fun to be had there for the little ones. 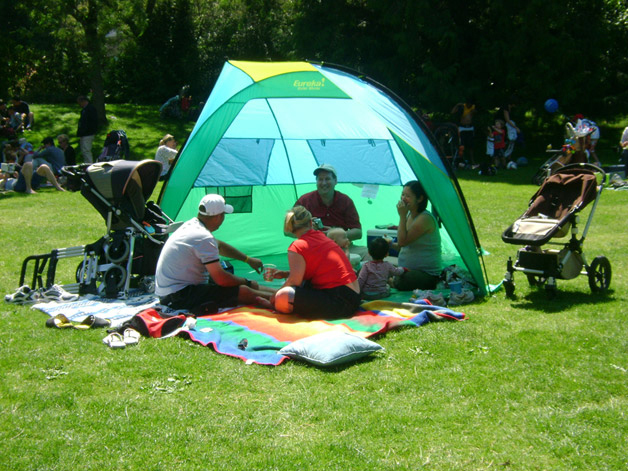 If you’re at Trimble park around lunch time, just know that the food is expensive and limited so bring your own picnic or grab something on 10th Avenue. There’s a Tim Horton’s about 2 blocks away. We’ll definitely return next year, hopefully by then Caden can ride the “Go Go Gater” Mini Roller Coaster….wheeeeee! I have 5 minutes before I “hit the hay” and I really wanted to get this out there. This weekend, I’m attending the Point Grey Fiesta. It’s a community gathering with events spanning three days (June 18th – 20th). A girlfriend of mine told me the Fiesta is “…a lot of fun, full of shiny, happy people”. Hmmmm….with a glowing (or should I say shiny) review like that, how can I say no. The epicenter of this intriguing event is Trimble Park, where a variety of carnival rides will magically appear for 3 days. Carnival rides in the center of the city? That sounds like a cute, old fashioned, small town fair to me (which I love). To check out the rides head to Trimble park Friday afternoon, Saturday or Sunday at the times specified below. You can purchase early-bird tickets from West 10th merchants or purchase regular ride tickets on the day. West 10th Avenue 18:00 On-street entertainment & outdoor cooking. Trimble Park 15:00- 21:00 Carnival rides. West 10th Avenue 09:15 Parade assembly on Blanca Street. 09:30 Decorated bike contest on Tolmie Street. All day – Sidewalk sale. Trimble Park 11:30 Opening ceremonies. Get ready, Canada Day is almost upon us. Every year, I end up at Granville Island on Canada Day. In order to make the most of the festivities, I follow a few simple rules. In the past, there have been a smattering of musicians, international food vendors, retailers and dancers setup around the Island. Maple leaf pins and paper flags are given away as are tattoos at the ever-popular maple leaf tattoo booth. On the whole, I find the line-ups frustrating, the food so-so, and the parade (while cute), not worth the wait. The parade was about 4 minutes long and was predominantly made up of Granville Island retailers in costume. Wear red to get into the Canada Day spirit. Bring lots of sun screen. Get there early before the swarms of people arrive. Bring a cooler containing lunch and lots of drinks (picnic style). You could also send someone to buy meat and cheese at the market. If you aren’t there early be prepared to wait in lines. Bring a blanket and umbrella and claim your spot on the grassy meadow behind the playground and water-park (I like to call this “Home Base”). Be prepared for your kids to get wet (there’s a wicked water park a stone’s throw away). Bring some inflatable balls and other inexpensive toys for your kids (…with so many kids in one place you’ll find that everyone plays with everything… it’s good to share, that’s why I say inexpensive). Bring Grandma or Grandpa and tell them to “hold down the fort” while you go on small trips to the bathroom (inside the False Creek Community Centre), to view the parade or to grab another tattoo. Keep these things in mind when you’re crafting your Canada Day experience at Granville Island and I’m sure you’ll have a great time. How you bribe your parents to come along for the day is up to you.